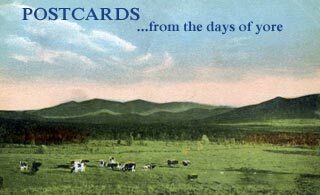 One of the last classic Main Streets in New England, downtown Littleton is a vibrant center of commerce in a town nestled along the banks of the mighty Ammonoosuc River, close by the picturesque White Mountains of northern New Hampshire. 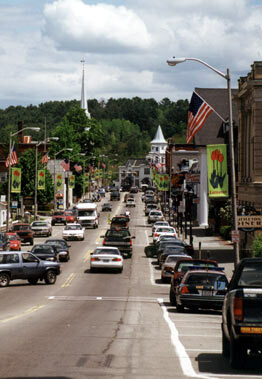 CONCORD, NH — The National Trust for Historic Preservation’s National Main Street Center, headquartered in Washington, DC, announced at its national convention, in Ohio, on Monday, May 19, 2003, that Littleton, NH won a Great American Main Street Award (GAMSA). GAMSA, sponsored by OSRAM SYLVANIA, recognizes outstanding achievement in the revitalization of a Downtown. Annually, the top five Downtown revitalization programs nationwide are honored with the award. 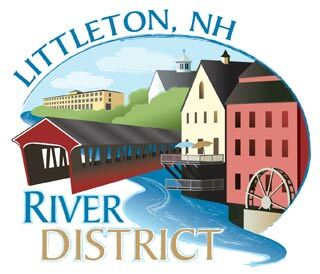 Littleton will receive $2,500 to use to further their revitalization activities, a bronze plaque, and a set of road signs commemorating their achievements. 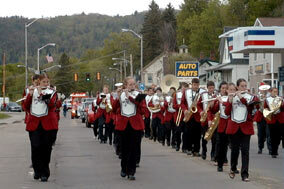 Jaffrey, NH was named a semifinalist in the competition.
" Littleton has far exceeded the expectations of the New Hampshire Main Street Center," said Kathy La Plante, director of the New Hampshire Main Street Center. “The community has a long list of accomplishments and highlights that make them a truly extraordinary community. It’s wonderful that Littleton’s efforts are being recognized nationally." Littleton contingent receiving the Great American Main Street Award. From left to right: Stu Baker- former assistant town manager, Jason Hoch- Town Manager, Ruth Taylor- Executive Director, Mike Claflin, Karen Kaezerian, David Wood, Gail Kimball, Carol Hamilton, Brien Ward- Board Members. Downtown offers a nice variety of restaurants, an historic inn, a motel, a 100-year old Opera House, dozens of specialty shops and numerous services, including a majestic post office, several local banks, a working gristmill, the world’s longest candy counter (No kidding! It’s in the Guinness Book! ), and a sculpture of the original “glad girl” herself: Pollyanna. Much of the credit for the appearance and vitality of downtown Littleton goes to the dedicated volunteers of Littleton Main Street, Inc. By encouraging business and property owners to pay attention to the physical appearance of their businesses, fostering good customer service, and providing Main Street business with the tools to improve their marketing, Littleton Main Street has helped create a climate of hope and success. A certified National Main Street Community since 1997, Littleton has twice been a finalist in the Great American Main Street Award competition sponsored by the National Trust for Historic Preservation. Using the National Main Street Four-Point Approach©, Littleton has managed to lower the retail vacancy rate to 2% (after a high of 20% in 1992). A 501 (c) (3) non-profit corporation, Littleton Main Street, Inc. is managed by a 13-member volunteer board of directors, four committees and one paid staff member. Organization Committee – oversees the administration of the program. We can use folks who like to organize fun(d) raisers, or just stuff envelopes and keep the office humming. Promotion Committee – seeks new ways to market the downtown. Got a great idea for a retail promotion or special event? Help out at the popular Littleton Farmers’ Market! Design Committee – pays attention to physical appearances and cares about preserving our downtown assets. 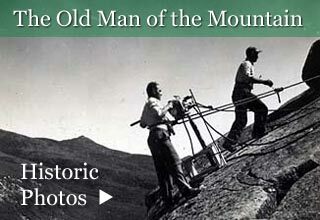 Have you got a passion for historic preservation? Business Development Committee – help local business thrive and prosper. Do you have a knack for business recruiting? Volunteers are routinely offered opportunities for free training in the work of these committees through LMSI’s affiliation as a N.H. Main Street Community. If you are interested in the business opportunities on Main Street, let us know. We keep a list of current vacancies (there aren’t many! ), and we also have a set of business tools that will tell you what residents and visitors to Main Street are looking for in consumer goods and services downtown. Contact us and we can send you information about doing business on Main Street.